We received news of the captured of Khairul on June 26, about 11:30 am, from Datuk Laksamana – traditional leader for sea management in Aceh Tamiang District. Datuk Laksamana received information from Khairul Alam, 15 years old students. Khairul Alam is one of the students involved in FGD (Focussed Group Discussion) about formulating the educational material to save Painted Terrapin that we carried out in last June. Meanwhile, Datuk Laksamana is one of the volunteers who very often to assist us in providing information from the field. After receiving a telephone report from Datuk Laksamana, we went straight to his house in the village Sungai Kurok III. Arriving at his house, one of our local volunteers – Abdul Hakim, 22 years old – rushed off to the fisherman’s house to take that male. 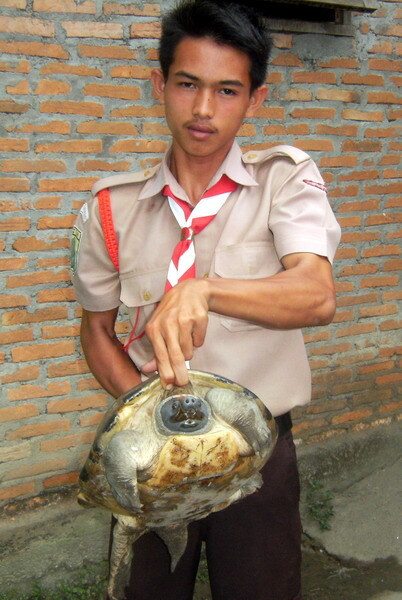 At about 1:00 pm, Hakim and Khairul Alam arrived at Datuk’s house carrying male of Painted Terrapin. Then, we carefully check the surface of his carapace, plastron, head, mouth, tail and feet to see if there were injuries that might be caused by nets or wrong treatment during in fishermen captivity. Thankfully, there were no injuries caused by the net or during kept by fishermen. The male also showed the aggressiveness of the movement. 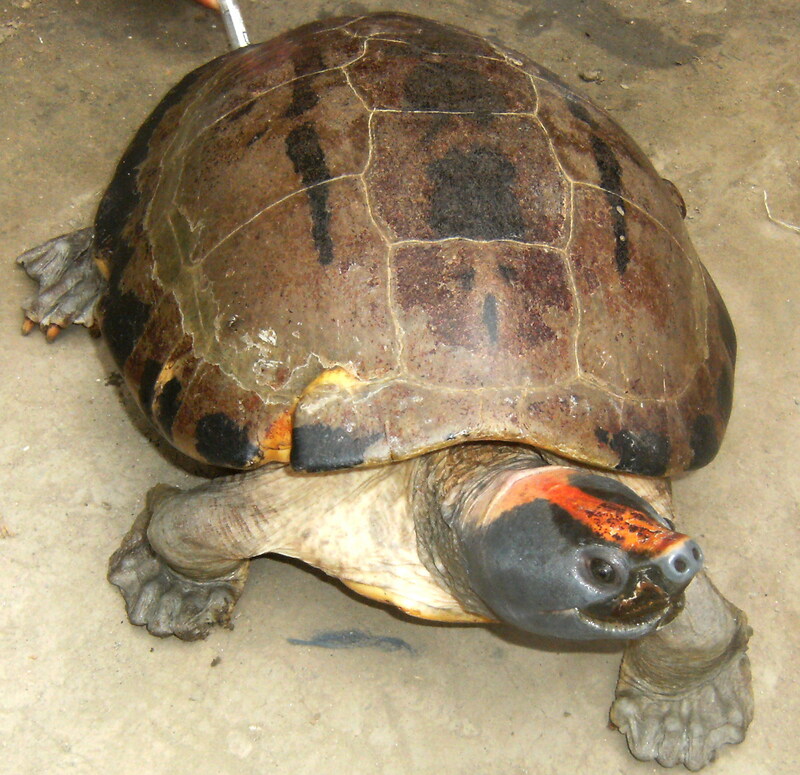 He has a carapace length (curve) 40.2 cm, width (curve) 38.6 cm and weighs 9.5 kg. While at fishermen house, this male was kept in a bucket – about half a meter in diameter – and fed bananas and spinach. Then, we marked an ID by cutting his marginal of carapace edge and gave him a name Khairul. This name was given to appreciate the Khairul Alam’s attitude, 15-year-old student, who gives information about the caught by fishermen to Datuk Laksamana, and then Datuk forwarded to us. By giving this name, we also hope to fostering the emotional relation between humans and Painted Terrapin. After all of the basic data obtained, we brought Khairul to Titi Putus river – name of the river in the village Sungai Kurok III that bordering to Seruway Mangrove Forest- to be released. At around of 2:55 pm, Khairul released to swim to the river which has about 5 meter depth. Titi Putus river is approximately 45 minutes by boat to Kuala Peunaga area – location where Khairul caught by fishermen on 20 July. Yes, you can use of our picture to your project. I have seen your website and that is great. Your project is very useful, interesting and helpful to turtle enthusiast and works. Yo did a great works!